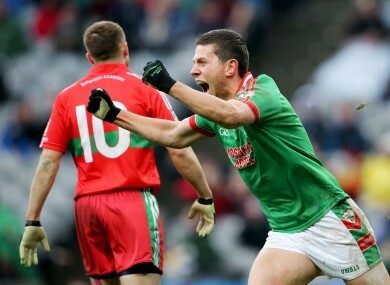 Mannion was named the man-of-the-match in the 2013 All-Ireland club final. Karol Mannion in action in the 2013 All-Ireland club final. FORMER ROSCOMMON FOOTBALLER Karol Mannion has announced his retirement from football. Mannion, who retired from the inter-county game in 2014, concludes his career as one of St Brigid’s most influential players in a career that spans across two decades. 2013 was undoubtedly the crowning moment of his career, when he put in a man-of-the-match performance as part of St Brigid’s stunning comeback in the All-Ireland club final against Ballymun Kickhams. In addition to the All-Ireland honours, Mannion concludes his career with 4 Connacht SFC titles and 9 county SFC titles with St Brigid’s along with a Connacht SFC title with Roscommon in 2010. Paying tribute to Mannion and fellow team-mate Robbie Kelly – who is retiring from senior football – St Brigid’s posted the following message on their Facebook page. Email “All-Ireland club winner Karol Mannion calls time on his football career ”. Feedback on “All-Ireland club winner Karol Mannion calls time on his football career ”.